That being said, here we are 50yrs later and much has changed except our lack of sensitivity to concerns some “protected groups” might have; as some of their grandparents, or even parents still faced racism. The LGBT community has faced disdain even as recent as the 1970’s. That being said social norms should dictate that we ALL deserve protection and take of one another and focus on victimization of ALL peoples and protect ALL innocent individuals from those of ALL colors, cultures or creeds that would do anyone harm. I do think the left doesn’t realize how much people value constitutional rights, and that more and more people are starting to get amused at constantly being called a racist or phobe. It is going to start losing shock value and start to mean that a non left person is winning a conversation. The left isn’t interested in discussions, they simply want to dominate. Their reasoning skills are extremely challenged, and rather than be exposed, they prefer to shut down the debate with emotional catch words, which the Democrat Identity politics toolbox gives them the mother of all selections. What is happening today is not much different from what happened when the Marxists shut down debate in Communist Russia, in Communist China, and in Communist Cambodia. Tens of millions soon died. The only thing keeping the left from their objective is the Constitution and Trump. Our technology has disabled our critical thinking. And it’s a blessing to have women like you in America, for you are few and far between. The left has massively indoctrinated women, with 70% of single women voting Democrat, and the majority of married women too. That mindless SNL skit about Trump’s supporters being racists perfectly typifies the simple minded attitudes of Democrats. A lousy, biased, corrupt SNL skit is used to determine their voting habits. If you can make them laugh, no matter how stupid of a lie you show, they will love and like you. Great points! I think the left has lost the ability to laugh at oneself and takes everything as a grave insult… Fits perfectly for their victimhood narrative! Many on the left aren’t interested in an actual discussion. They have decided what truth and reality is for this moment and it must be accepted. Become a part of the mindless drones and listen to the far left. The hypocrisy that you point out in your post indicates the lack of intellectual honesty on the part of those complaining of microaggressions. While some lefty might come up with an abstruse, convoluted argument about how a common remark or question such as “where are you from” is somehow denigrating, leftists engage in and encourage overt hostility towards my demographic: straight, white, male NRA members. Indeed, the left’s preoccupation with microaggressions seems silly when they applaud the actual physical hostility of Antifa. Principles do not change based on expedience. 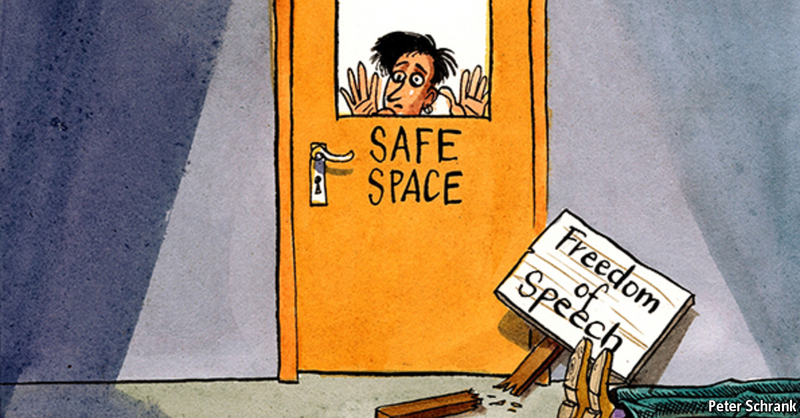 If the left complains about microaggressions based on the principles of tolerance and acceptance, that should apply to all demographics and political points of view, even those that they don’t like. By failing to do so, the lefties expose themselves as nothing but political grifters. I’ve been asked where I’m from many times and I’ve never taken offense to the question. I’ve always viewed it as innocent curiosity, actual interest and polite conversation. Perhaps that’s because I consider my own and everyone else’s background to be something to be proud of and to celebrate. I remember many years ago asking a co-worker who spoke with a thick Irish brogue if he was from Ireland. Apparently, today that would be a microaggression of unpardonable gravity. Fortunately, he didn’t think so. After saying “Of course I’m from Ireland,” he proceeded to tell me how, as a young man, he fought with the IRA, then, after Irish independence, traveled to New Zealand before finally moving to the U.S. Not only did my, now un-PC, question lead to my hearing a very interesting life story, but it was the beginning of a rewarding friendship. Lefties shut out so much when they let themselves become preoccupied with looking for reasons to be aggrieved instead of actually exercising the tolerance and acceptance that they preach. I would argue that none of your examples are microaggressions. They are blatant, all out, bigotry, racism and sexism. The definition of microaggressions fits rather well as gaslighting, a rather common form of psychological abuse, and one which leftists have become expert at. I’m off Facebook for Lent, and my life is much more peaceful right now. Being in the boonies, it’s there that I see most of what you describe. And boy, do lefties go into denial or outright rage if you point out their fallacies. They just trip over themselves to make themselves out to be the victims, while those who point out their fallacies are the evil ones. Funnier still is the mental gymnastics of leftists who try to portray themselves as being all about love and kindness, and how they don’t take sides. They’ve taken sides, all right, but in their delusions, they actually believe their views are neutral or centrist. I think the worst was from a family member, shortly after Trump was elected (she is a Canadian, like me, who was already suffering from HDS – Harper (our former Conservative PM) Derangement Syndrome), who went into an all out Trump-and-his-supporters-are-Nazis delusion, posting things like “violence is bad, but it’s okay to punch a Nazi.” The word “Nazi” basically meant any Trump supporter, any conservative, and any white person who didn’t bow down in shame over the colour of their skin. This person, of course, didn’t know – or care – how insulting her statements were to people who fought real Nazis, or those who survived what real Nazis did – like my parents, who were too young to be enlisted, but not to young to be enslaved, imprisoned, beaten, starved, or watch their friends and family murdered by Nazis and their sympathizers. Years ago, I came to the conclusion that there are none more intolerant than those who demand tolerance. In the last few years, that has expanded to, there are none more racist than those who see racism everywhere, there are none more bigoted and hateful, than those who see bigotry and hatred everywhere, and none more sexist than those who see sexism everywhere. Very good points! and I do agree my examples are all targeted incidents. I do think though, it goes under the definition as it includes targeted slights. I think some of my examples have become so commonplace, that people who aren’t us no longer see it as offensive or hurtful on a real level. Interesting thought as I read this. Isn’t the seeing of microagressions everywhere, just another microagression? Their whole thing, when it comes down to it is, in my view, a psychological defense – projection. I’ve encountered it in many areas, including in court. A person who is a habitual liar assumes that everyone else is also a habitual liar, so they immediately accuse others of lying, to cover the fact that they, themselves, are lying. I can actually use one person as an example who was very quick to accuse us of lying, discrimination and racism, when he was engaging in all of those. Needless to say, when he started threatening to accuse my husband of sexually assaulting his daughters, that set off all sorts of red flags (there turned out to be significant abuse, but because he was a Muslim and not-white, Children’s Services defended and protected him, rather than his daughters). Projection is something I see quite a lot of, and the rise of “microaggression” accusations is very much part of that. Very good point! And I didn’t think of that angle! Perhaps they know on some level that what they’re accusing us of is exactly what they’re doing! I believe that is true – at least on a subconscious level. In the example I gave of the person who made various accusations and threats against us, it was part of a very obvious, undiagnosed mental illness. Likely, Paranoid Personality Disorder. A lot of this is, in my observations, resulting in increasing mental illnesses. My inner psychologist has a field day, every time I find myself encountering these situations. “Micro aggression: See Trump, Donald, J., Virginia march, Central Park, 5, etc.,m etc., etc., since the day he was born.” See also; “Trump, Fred & the KKK, see also Trump, Donald J, Jr., Trump,l Erik, Trump, Ivanka” See NY State vs Trump, re: real estate rental violations, etc. “Leftist, really?” Lady of Reason sounds like she slipped off her meds. Sorry about your diagnosis of late stage TDS ;)…. If I were”RaPar”, I’d be concerned about seeing everything re: Trump as some sort of …phobe. And start taking more meds. Those who hold the views of the left are mainly concerned about losing power over others. Everything they say or do is an effort to stem the tide of common sense and logic which seems to be making a comeback in real life. Folks are starting to see that they are better off in the last two years with Trump at the helm, than the previous eight with the 0zero administration. That reality is being attacked more and more every day in an effort to shut out the positives of the current administration. Thus, the terminal cases of TDS being exhibited throughout the land, and with “RaPar”. Needs help, obviously.